The Lunar New Year is the most important holiday in South Korea, as it is for roughly 1.7 billion people throughout China, Japan, Mongolia, Tibet, and Vietnam. The festival celebrating the New Year traditionally begins on the first day of the first month in the Chinese calendar and ends with Lantern Festival which is on the 15th day. This year it starts Feb 3, 2011 and finishes at Feb 18, 2011. The Sedona Korean-American Association (SKAA) is excited to bring a taste of this celebrated Asian holiday to Sedona for the first time. 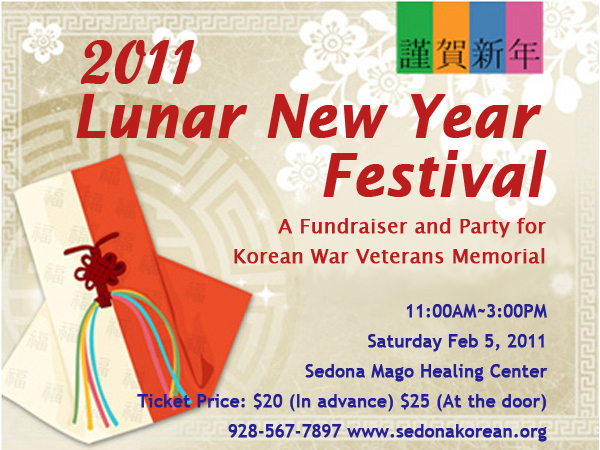 On February 5th, the Association is proud to host the ‘Lunar New Year Festival’, open to all Sedona residents. The Festival will celebrate the Lunar New Year as well as double as a fund-raiser for one of the SKAA’s main goals: raising a Korean War Veterans Memorial Monument in the Verde Valley. The festival will be held at the Mago Healing Center, 340 Jordan Road from 11am to 3pm. Banya Lim, president of the association, will serve as the master of ceremonies and invite everyone to be part of the Korean New Year’s tradition and games. The Lunar New Year Festival will include elements of a typical celebration, featuring Korean food, Chinese Zodiac fortune telling, Sebae(ancestor ceremony), singing, traditional games, Korean movies, and calligraphy art. There will also be a raffle with various gifts from local businesses. Tickets are $20 if paid in advance and $25 at the door. Tickets may be purchased at Mago Healing Center (340 Jordan Rd.) and Mago Café (207 North Highway 89A). All profits from the event will be contributed to the fund for raising a Korean War Veterans Memorial Monument in Verde Valley. What: Traditional Asian Food, Folk Games, Personalized Calligraphy Art, Chinese Zodiac Fortune Telling, Korean Movies, Sebae (Traditional Lunar New Year Ceremony), Raffle.